Have you seen this guy outside the DSA? He's usually on Duke St. just north of Corporation. Awesome. That's Darrell Thompson. He's the fabulous photography teacher at DSA. ah yes. Mr. Thompson. also known as T-Pizzle. such a great guy. photo teacher extraordinaire. 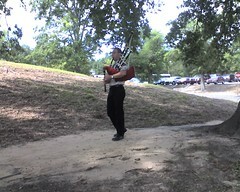 and plays the bagpipes too. which is awesome. The guy is my hero (right behind John Schelp). T-Pizzle fo' shizzle.